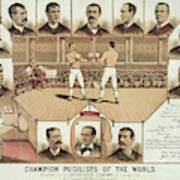 There are no comments for Boxing World Champions 1885. Click here to post the first comment. 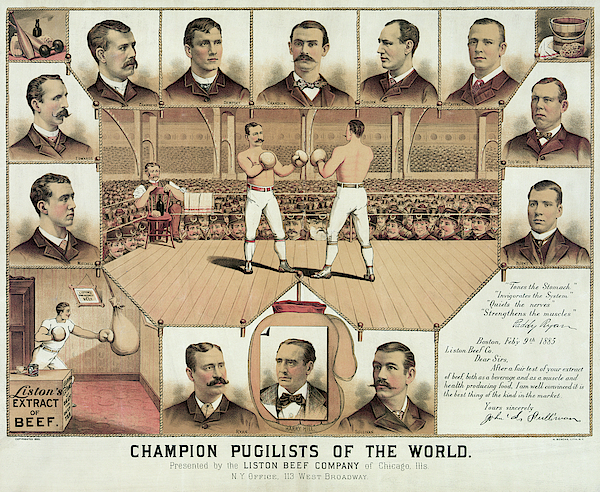 CHAMPION PUGILISTS of the World in 1885. 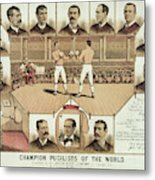 Here, John L. Sullivan, the Fighting Irishman, Paddy Ryan and other notable fighters of the era promote LISTON's Beef Extract. At the bottom right, Sullivan and Ryan make statements about how good the product has been, along with their signatures. Boxing of that era was relatively grueling and brutal compared to today. 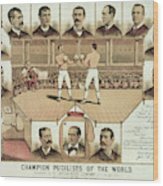 Sullivan claimed the title of heavyweight champion of American in 1882 against Paddy Ryan after stopping him in nine rounds. Afterwards, Ryan said, "When Sullivan hit me, I thought a telegraph pole had been shoved against me endways." Many fighters were of Irish descent. A tribute to the grit and determination of the Irish. Online are many colorful biographies of the men displayed in this piece. I recommend you read about them. For example: search Harry Hill boxing.